Arik Air has increased frequency on the Lagos to Douala via Cotonou route from four to six weekly flights. The new schedule which took effect on October 11, 2015 is aimed at further enhancing connectivity in the West Coast. The flights from Lagos to Douala via Cotonou and back will operate on Mondays, Tuesdays, Thursdays, Fridays, Saturdays and Sundays. Outbound flights from Lagos will depart at 11:15am, arrive Cotonou at 11:45am, depart Cotonou at 12:30pm and arrive Douala at 2:00pm. Inbound flights will depart Douala at 2:45pm, arrive Cotonou at 4:15pm, leave Cotonou at 5:00pm and arrive Lagos at 5:30pm. Commenting on the new schedule, Managing Director of Arik Air, Mr. Chris Ndulue said: “Nigeria and Cameroun share a lot in common as good neighbours and Arik Air is always happy to provide connections needed to foster closer relationships and promote trade”. 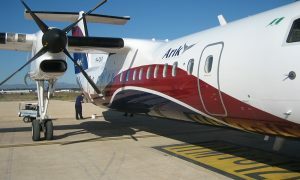 Arik Air is the only airline flying six times a week from Lagos to Douala via Cotonou and vice versa.